Sports Reflex Trainer is a simple voice-activated iPhone app designed for anyone needing a variable interval reflex trigger. It can be used to enhance desired controlled responses and helps to extinguish undesirable conditioned responses. Available for $2.99 on the App Store. Say "Ready" to activate. The app will respond with an activation beep acknowledging the command. A random number of seconds will then elapse (minimum and maximum value can be adjusted by the user). When the random time period has expired, the app will play a sound indicating the firing of the reflex trigger. Train yourself to control your shot and not give in to target stimulus (the dreaded "target panic" or "bulls-eye shyness"). Retrain premature shot releases or freezing off the target. Use by bringing your sight picture onto the target and saying "Ready." Hold until the trigger sound plays and then fire. This forces you to hold on the target until the random signal triggers the shot, breaking the habit of using the target acquisition as the trigger. Train for coming off the starting block by practicing responding to indeterminate starting intervals. Enter the starting block, say "Ready," then wait for the trigger sound before starting. You can even change the activation sound to say "Set" and the trigger sound to a gun shot to better simulate a competitive environment. When kicking alone, you can train yourself to wait for a simulated "snap" before approaching the ball. Set the ball up, take your steps back, and say "Ready." Wait for the trigger sound before executing the kick. This will condition you to perform kicks in response to an external stimulus rather than your own internal clock. Voice activation works either with the built in iPhone/iPad microphone or with a standard wired headset (including the default Apple-provided earbud mic). Support for Bluetooth headsets is experimental; your mileage may vary. 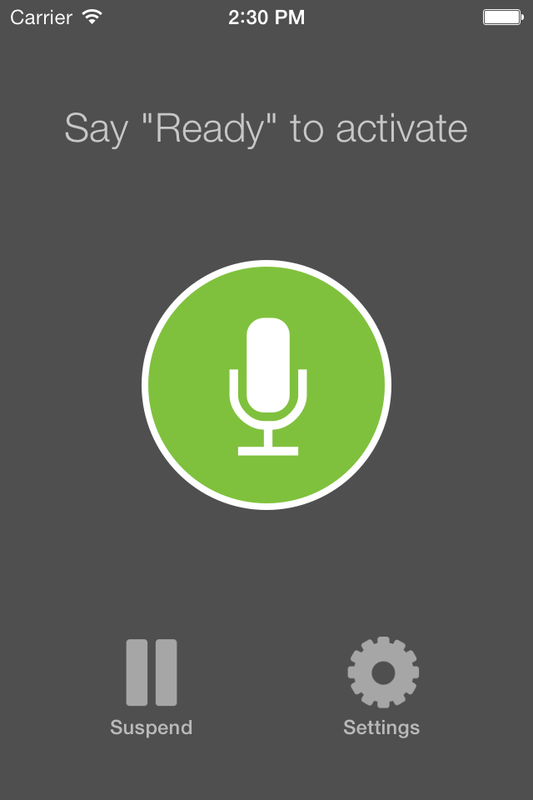 Note also that the voice activation may not work well in environments with a lot of background noise and/or talking.